Working on Kabali has given me a lot of respect in the industry and I must thank Rajini sir, Ranjith and Dhanu sir for this opportunity.Although Kabali is a huge film, I would say that we are under no pressure at all. To be honest, we are very relaxed. Kabali has several moments that will make you clap in joy. 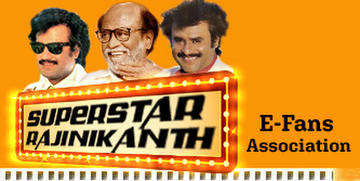 For instance, Rajini sir’s introduction scene is going to make fans erupt in joy. I don’t think there has been an intro like this for Rajini sir in the last few years. It is sleek, stylish and done in a very artistic fashion. I think Ranjith has pulled it off very well with help from the cinematographer Murali. How much of Kabali is done? I have already logged the first half. I am looking to finish off the second half by this week. Teaser work is also going on. The teaser will not be more than a minute. Considering you are an editor who has an eye for detail, which is your favourite sequence in Kabali? The first fight that happens in the movie establishes his character in the film. It is something which has been done very carefully. It shows what he is and what he has done as a don. It is a very short sequence. But the way he fights and the manner in which he delivers the dialogues, you will actually fear the guy. 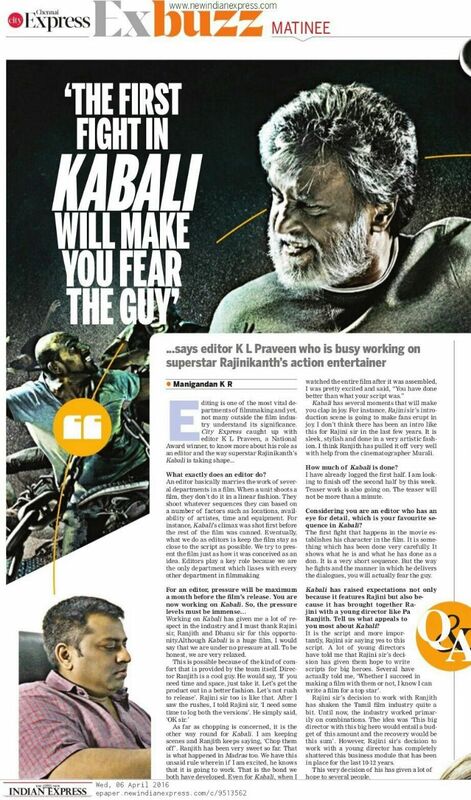 Kabali has raised expectations not only because it features Rajini but also because it has brought together Rajini with a young director like Pa Ranjith. Tell us what appeals to you most about Kabali? It is the script and more importantly, Rajini sir saying yes to this script. A lot of young directors have told me that Rajini sir’s decision has given them hope to write scripts for big heroes. Several have actually told me, ‘Whether I succeed in making a film with them or not, I know I can write a film for a top star’. Rajini sir’s decision to work with Ranjith has shaken the Tamil film industry quite a bit. Until now, the industry worked primarily on combinations. The idea was ‘This big director with this big hero would entail a budget of this amount and the recovery would be this sum’. However, Rajini sir’s decision to work with a young director has completely shattered this business module that has been in place for the last 10-12 years. This very decision of his has given a lot of hope to several people.